I just wanted to take a moment to express my heartfelt wishes for all of you out there this holiday season. I wish you joy, and peace, and a special time spent surrounded by your loved ones. I wish you health, and happiness, and that you have or find motivation to reach for the stars this next year. I wish you all love, for yourself, and for those you call family and friends. Most of all, I wish for you, dear readers, a Merry Christmas to you and yours and a very Happy New Year! I was recently privileged to be interviewed by Jason Foss about the inspiration for my novel Virtual: Can you be sure what’s real? and my future work on his blog, A Dreamer’s Blog. Nell Ingram doesn’t think she’s special; actually she’s afraid that the strange “gifts” she has, if discovered by the God’s Cloud of Glory cult she escaped from as a child, would see her burned at the stake. So she lives alone, almost completely isolated save for her mystic connection to the forest that she barely understands. Being alone protects her; being alone is comfortable, but her quiet isolation is not meant to last. 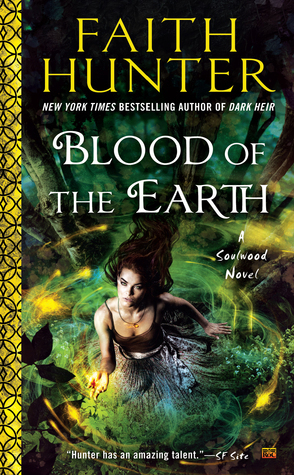 Forces meant to help and harm are both coming her way, and Nell will be forced to use her strange connection to the Earth to save lives. This first book in a new series by author Faith Hunter revisits a world where “paranormals” live and work side by side with ordinary humans, and both groups are touched by good and evil. When Homeland Security’s special division for dealing with paranormal crimes, PsyLED, saves her life, Nell Ingram is forced out of her self-imposed isolation to assist in a case involving the kidnapping of multiple young girls, and work with a group of individuals whose gifts are just as unique as her own. Nell’s insider knowledge of the God’s Cloud of Glory church, which is suspected to be involved in the kidnappings, makes her a valuable asset. In order to save the lives of the innocent girls, one of whom is her own sister, Nell will have to face her past, and push her strange powers in ways she’s never before imagined. I picked up this book as a choice from my local book club, and I really wanted to like it simply because of the location; the setting is mainly in East Tennessee, in and around Knoxville, an area that is near and dear to my heart. While the descriptions of the region and are spot on, I had more difficultly with the plot. The story seemingly meandered along for the first half of the book, before the pacing finally picked up somewhere along the last third of the text. Granted, some of this was necessary world-building, but it seemed to me to be a bit excessive in mass. Still, by the end I was fully invested in the action, and cheered Nell and her team on as they reached a very satisfying ending, and epilogue. I offer this story three and a half stars, and would recommend that readers interested in paranormal and urban fantasy stories check out this series as well as other works by Faith Hunter. The hubby and I actually went out to see a movie last week, instead of waiting till it came to us via Netflix or Redbox, and were charmed with the film we chose. For those who grew up during the era games like Pac-Man were the latest craze, visiting Litwak’s arcade is like a trip down memory lane. When an accident damages Vanellope’s vintage console, Ralph and Vanellope undertake a trip through a new addition to the arcade, a network connection, in order to locate a replacement steering wheel from E-bay. What they find in this new world will alternately amaze and horrify Ralph, while Vanellope soon finds herself longing to stay. While Ralph is perfectly happy with the way things are and doesn’t want to change anything about his life or his friendship with Vanellope, she is struggling with the monotony of her unchanging environment in the arcade. Ralph wants to make Vanellope happy, and goes to great lengths to help her fulfill her dreams, and then nearly destroys them, along with the entire Internet, when his own insecurities and possessive behavior come into play. This version of Vanellope is still adorable; but is experiencing angst that comes from the struggle to come into her own. She is bored with the current track options of her own game, and quickly becomes enamored when introduced to “Slaughter Race,” a game for more “mature” audiences, and especially its own leading lady, a female racer named Shank. She regards Ralph as her best friend, but is learning that it’s okay to grow and try things on her own. They will have to learn to be honest with each other, and accept that it’s okay to want different things, in order to save their friendship and stop the virus destroying the Internet. One of the highlights for me was the scene where Vanellope accidentally finds her way into the dressing room of the “other” Disney princesses, who then assist in saving the day, or rather the “hero” in distress, Ralph! This is movie is rated PG, though the climax with the attacking “Ralph” virus may be scary for some younger viewers, and is in theaters now.